"The cost of doing that runs into the hundreds of millions and will dramatically affect our 5G business case," he said. "We would have to slow down the deployment of 5G very significantly." There are fears that China is using Huawei as a proxy so it can spy on rival nations and scoop up useful information. And its products are regularly subjected to security testing by the UK's GCHQ intelligence agency. Huawei, however, is keen to portray itself as a private company owned by its employees, with no ties to the Chinese government beyond those of a law-abiding taxpayer. But critics question how free any major Chinese business can be from Beijing's influence. And they point out Huawei's media-shy founder, Ren Zhengfei, was a former engineer in the country's army and joined the Communist Party in 1978. Mr Petty said the UK was a leader in 5G readiness and would fall behind if Huawei was banned. And its policy had been framed by advice from the National Cyber Security Centre (NCSC). Vodafone's general counsel, Helen Lamprell, said there was no evidence that Huawei's equipment posed a security threat. "Huge impact to the government's ambition to be a leader in 5G, huge cost to the industry... for what?" she asked. "If there's evidence, we would love to see it - but so far we haven't seen any evidence." Vodafone is using the US firm Cisco at the core of its 5G network, the most sensitive area, and equipment from Sweden's Ericsson elsewhere. Huawei's equipment is just being used at the radio masts, which Vodafone says is a very low risk area: hacking any individual mast would not allow access to the wider network. 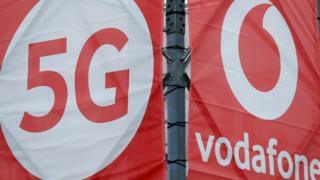 Vodafone also joined calls for all telecoms equipment-makers to undergo the same kind of scrutiny as Huawei. "Huawei are subject to a lot of scrutiny which we think is great," Ms Lamprell said. "But they're not the only vendor and the same engineering issues apply everywhere." Ms Lamprell also refused to rule out the return of roaming charges in the event of the UK leaving the European Union without a withdrawal agreement in place. Vodafone would far prefer to maintain the status quo for travellers, she said, but could not be sure what European mobile companies would charge after Brexit to handle calls from UK travellers. "What we have to face is: are we going to get a massive bill coming back in the other direction that we can't absorb?" Ms Lamprell said. Vodafone also revealed that all the mobile operators wanted the limit on phone-mast height increased from 25m (82ft) to 50m. The mobile operators are under pressure from the government to improve coverage in remote rural areas.